During most of the slot car craze of the late sixties, I was too young and too poor to really play. When I was a few years older, a teen, and had my own newspaper route, and cash to spend, slot car racing was already gone. But it has remained alive in my imagination ever since! In 1964, I was five years old, and Dad bought a Strombecker 1/32 scale Figure Eight home slot car set. It had a bridge for the overpass, so the two lanes were equal length. There were two Jaguars, red and black. Dad, my younger brother David and I drove them around and around and around. The straights were very short, and the turns long, so you started slowly and gradually went faster and faster. The cars had skinny tires, and you were more likely to spin out than deslot! In 1966, I was seven years old, and Dad bought a Revell kit: a white Corvette Stingray slot car, with an aluminum chassis and gray Mabuchi motor. It was beautiful, and so fast on our Figure Eight home track that it pulled apart the track sections! The hand controllers overheated and melted their plastic cases! Later in 1966, Dad bought a second Revell kit: A 1/24 scale red jalopy, which I think was a '33 Willys. It had a stamped brass chassis and a big red Mabuchi motor. This car couldn't run on our figure eight at all, because the tall roof crashed into the overpass! Dad realized it was time to graduate from the home track. In 1967, I was eight years old, and Dad took us on our first trip to a slot car raceway. We were so excited! I remember to this day walking into the slot car shop at Brook Hill Azalea, in Richmond Virginia, and staring, astounded, speechless, at three huge, awesome 8 lane tracks, with straights miles long, and a wall packed full of cars, parts, rentals, magazines and trophies. Dad knew what to do - had he secretly been here before? We paid for a half-hour on the smaller Kids track, and started racing! Or I should say, we started crashing! We had to learn how to drive a slot car! Dad played turn marshall, and after a half hour of putting our cars back in their slots, I thought he was signaling for us to go home. But NO! Dad paid for two lanes on the humongous red track with a front straight that seemed as long as our house, and a flat-out 60 degree banked turn! We thoroughly trashed the two Revell cars, bending axles, losing tires and smashing the plastic bodies to pieces! It was awesome! I was hooked! I remember several slot car shops around Richmond, but the one at Brook Hill Azalea particularly sticks in my mind. We made Saturday afternoon trips there about five times per year. I begged Dad to take us more often, but we were four boys, and cars and track time were becoming more expensive. In the meantime, Dad brought home Car Model Magazine, and Model Car Science, and Model Car and Track. I devoured every word, every picture, every ad. I was totally fascinated by the slot car pros and their scratchbuilt brass chassis. I designed and drew slot car chassis in my third grade school notebooks. In 1968 I was nine years old, and Dad's job had sent him to Endicott, NY for training. While he was there, he built 5 or 6 plastic models, and two new slot cars! For me, Dad had put together the Cox Chapparal 2E, white, with the working wing! For David, Dad built a blue Champion Lola GT. When Dad got home, we took the cars racing. David's Lola totally blew away my Chapparal. His Champion 601 motor simply screamed down the long straights. It showed the difference between model car racing, and real slot car racing! To add injury to insult, after about ten minutes, the plastic piece that actuated my flipper wing melted, the motor came loose and was ejected out the back of the car. 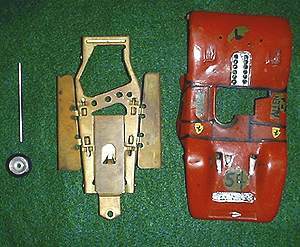 In 1971, I was twelve years old, and Dad bought me a Dynamic Can Am Ferrari Group 12 Anglewinder for my birthday. A gift from the slot car gods! Dad dropped me off to race at my familiar hobby center. I didn't understand why, but there was only one track left of the three they once had. It was the blue fiberglass pro track, an extended figure eight. I drove my Dynamic Ferrari around and around and around, in slot car heaven! But the next time I went racing, the slot car center was closed! The slot car craze was over! I was crushed! I didn't do anything connected with slot cars for the next thirty years, until 1999, when I started collecting scratchbuilt slot car chassis.